Pakistani Prime Minister Imran Khan attends talks with Chinese President Xi Jinping (not pictured) at the Great Hall of the People in Beijing, Nov. 2, 2018. Pakistan’s new prime minister, Imran Khan, is in China on a four-day visit, his first trip to the country since taking office in mid-August. The visit comes as the Pakistani government struggles with a financial crisis and as it looks to foreign countries for aid, while negotiating a bailout with the International Monetary Fund. On Friday, Khan met with China's president, Xi Jinping, and told him that his country is going through a "very difficult" economic situation. Neither Xi nor Khan said anything about possible aid to Pakistan in front of reporters, but China's leader did talk about his commitment to China-Pakistan ties and what he called their "all-weather strategic partnership." Pakistan has dealt with the question of bailouts before, but the situation is dramatically more complex this time as it seeks an $8 billion bailout from the International Monetary Fund. Questions are growing about the country’s ability to pay back loans connected to China’s massive infrastructure and trade plan known as the Belt and Road. One of the initiatives’ biggest projects is the $60 billion China-Pakistan Economic Corridor (CPEC). At the same time, however, Washington has stressed that the U.S.-backed IMF should not provide Islamabad with funds to pay back loans to China. A former cricket star and opposition politician, Khan has raised questions about the benefits CPEC brings to Pakistan. Khan’s PTI party, an acronym for its name in the Urdu language, has said the project is too heavy on infrastructure, has too many projects in India's Punjab state and too much corruption. A review that the new administration has undertaken has so far has turned up no irregularities and Khan has softened his criticism some, but the visit may force Islamabad to choose between CPEC and the IMF. During his meeting with Xi on Friday, the prime minister voiced confidence in the belt and road project, and what he called the Chinese president’s vision of connectivity. According to a statement released by Khan’s office in Islamabad, the prime minister said the belt and road initiative would translate into a win-win for shared prosperity in the region and beyond. 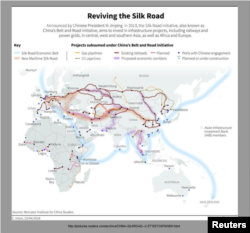 Map showing the projects subsumed under One Belt, One Road program by China. The statement also said the two reviewed the progress of CPEC, expressing satisfaction over its achievements and looked forward to its early completion. What kind of adjustments the two leaders may make going forward remains unclear. Andrew Small, a senior transatlantic fellow with the German Marshall Fund’s Asia Program, said he believes China is willing to make adjustments, but Beijing needs to know what the administration’s position is before it can make offers. In recent weeks, Pakistan has reduced the size of a rail project, shaving $2 billion off the final price tag. Small adds that neither side is likely to want to see the cancellation of projects and will work to keep the narrative moving in a positive direction. If more projects are canceled that would feed into broader concerns about China’s belt and road and debt diplomacy, something Beijing does not want. Jon Hillman, a senior fellow with the Center for Strategic and International Studies, said both sides would benefit from a renegotiation of some existing commitments. In China, scholars and analysts are questioning the huge amount of funds that Beijing is pouring into the belt and road initiative as well. Especially given the range of challenges China is facing at home from the economic slowdown to the trade disputes with other countries and massive local government debt. Online columnist Wei Jia warns that the debt crisis in Pakistan is similar to the sovereign debt crisis Greece experienced in late 2009. FILE - Protesters asking to drop the Pakistan's debt stand a "Friends of Democratic Pakistan" meeting in Brussels, Belgium. "If such a debt crisis also happens to other countries along the belt and road, and goes unaddressed, it will give China and the entire Eurasian continent a major political and economic headache," she noted in a recent article posted on Guancha.cn, a Chinese website for news and analysis. Others, such as Wang Yiwei, a political science professor at Renmin University, said Pakistan may be forced to shelve CPEC in exchange for the IMF bailout. But, he added, “China shouldn't shoulder the blame for some governments, whose debt crisis occurred as a result of domestic corruption and abuse of Chinese loans." Prior to his visit to China, Khan has already traveled to five other countries, an unprecedented move for a Pakistani leader. 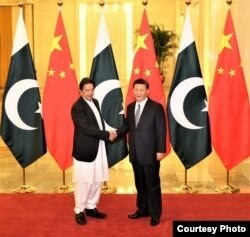 In the past, leaders have visited China first, analysts note, but Khan made several trips, including stops in Saudi Arabia and the United Arab Emirates in an apparent effort to diversify the country’s channels of external funding. After meetings on Friday and Saturday in Beijing, Khan flies to Shanghai where he will attend the first China International Import Expo, where he will be a keynote speaker. Joyce Huang contributed to this report in Beijing. Ayaz Gul contributed from Islamabad.